Zechariah 6, after describing God’s powerful angelic agents (verses 1-8), gets back to the subject of God’s temple and the return of Christ. “And speak unto him, saying, Thus speaketh the Lord of hosts, saying, Behold the man whose name is The Branch; and he shall grow up out of his place, and he shall build the temple of the Lord: Even he shall build the temple of the Lord; and he shall bear the glory, and shall sit and rule upon his throne; and he shall be a priest upon his throne: and the counsel of peace shall be between them both. And the crowns shall be to Helem, and to Tobijah, and to Jedaiah, and to Hen the son of Zephaniah, for a memorial in the temple of the Lord. And they that are far off shall come and build in the temple of the Lord, and ye shall know that the Lord of hosts hath sent me unto you. And this shall come to pass, if ye will diligently obey the voice of the Lord your God” (verses 12-15). Notice, God says “if ye will diligently obey.” You have to prove yourself to God. You must obey the voice of the flying scroll—the law of God, the authority of God, the government of God. “And it came to pass in the fourth year of king Darius, that the word of the Lord came unto Zechariah in the fourth day of the ninth month, even in Chisleu; When they had sent unto the house of God Sherezer and Regem-melech, and their men, to pray before the Lord, And to speak unto the priests which were in the house of the Lord of hosts, and to the prophets, saying, Should I weep in the fifth month, separating myself, as I have done these so many years?” (Zechariah 7:1-3). There is weeping going on because of something wrong with these priests and prophets in God’s house. God is concerned about this. What is going on in the world is not nearly as important to God as what is happening in His Church. His people are not heeding the flying scroll. We either heed the flying scroll, or we become deceived and arrogant. “Then came the word of the Lord of hosts unto me, saying, Speak unto all the people of the land, and to the priests, saying, When ye fasted and mourned in the fifth and seventh month, even those seventy years, did ye at all fast unto me, even to me?” (verses 4-5). Here is the Laodicean problem. Even when they fasted, it wasn’t for God. They were selfishly motivated. And God won’t have any of that! If they were directing their fasts toward God, where would they be today? They would certainly know about this flying scroll. They would be asking God to rule them, and God would lead them to His Work! Verse 6: “And when ye did eat, and when ye did drink, did not ye eat for yourselves, and drink for yourselves?” When you eat and drink, do you do it to glorify yourself or God? Here again the Laodiceans fall short. And look where they are today. You cannot show them their errors, because they are so self-righteous. It will take nuclear bombs with unparalleled suffering to turn 50 percent of them around! It will also take that nuclear holocaust to get the nations of Israel to repent. How dangerously self-willed human nature is! “Should ye not hear the words which the Lord hath cried by the former prophets, when Jerusalem was inhabited and in prosperity, and the cities thereof round about her, when men inhabited the south and the plain?” (verse 7). They won’t hear the words of the former prophets, which contain prophecy for us today. 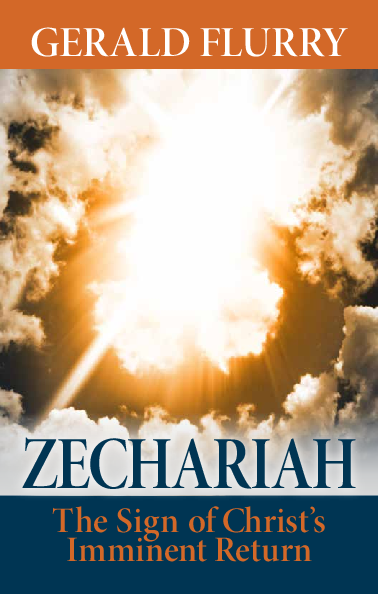 God discusses the former prophets two more times in Zechariah, as we will see. “Thus speaketh the Lord of hosts, saying, Execute true judgment, and shew mercy and compassions every man to his brother: And oppress not the widow, nor the fatherless, the stranger, nor the poor; and let none of you imagine evil against his brother in your heart. But they refused to hearken, and pulled away the shoulder, and stopped their ears, that they should not hear” (verses 9-11). The Laodiceans just stopped their ears. Therefore, they cannot understand our message. They are hard, and they are becoming even harder. “Yea, they made their hearts as an adamant stone, lest they should hear the law, and the words which the Lord of hosts hath sent in his spirit by the former prophets: therefore came a great wrath from the Lord of hosts. Therefore it is come to pass, that as he cried, and they would not hear; so they cried, and I would not hear, saith the Lord of hosts” (Zechariah 7:12-13). These former prophets have prophecy for today. God sent His message to the Laodiceans by His Spirit. He cried to them through the Philadelphia Church, and they wouldn’t listen. Then when they cry in the Tribulation, God says He won’t listen. Isn’t that fair? Isn’t that just? “Thus saith the Lord of hosts; Let your hands be strong, ye that hear in these days these words by the mouth of the prophets, which were in the day that the foundation of the house of the Lord of hosts was laid, that the temple might be built” (Zechariah 8:9). Many of God’s people heard all this right out of the mouth of a prophet. Certainly we did in this end time. We heard it right out of the mouth of Mr. Armstrong. God warns us that there is a greater responsibility when we’ve heard somebody say something from their own mouth. God even says many of us heard these words when the foundation was laid. He is very specific about the time—when Mr. Armstrong was alive. Then from Mr. Armstrong’s work comes the works of the Philadelphia Church and the Laodicean Church. “But I scattered them with a whirlwind among all the nations whom they knew not. Thus the land was desolate after them, that no man passed through nor returned: for they laid the pleasant land desolate” (Zechariah 7:14). There will not be a man left to cross paths with another man! That is about a nuclear attack. What a horrific ending. Zechariah 14:21 talks about spiritual Canaanites. There are spiritual Canaanites in God’s house today. They are spiritual pagans, spiritual Gentiles, spiritual Babylonians—just before the “times of the Gentiles” physically (Luke 21:24). But Christ will return to stop these “times of the Gentiles,” and God will rid His house of the Canaanites. “In that day shall there be upon the bells of the horses, holiness unto the Lord; and the pots in the Lord’s house shall be like the bowls before the altar. Yea, every pot in Jerusalem and in Judah shall be holiness unto the Lord of hosts: and all they that sacrifice shall come and take of them, and seethe therein: and in that day there shall be no more the Canaanite in the house of the Lord of hosts” (Zechariah 14:20-21).